The Silky Shark is a large species which is found in open waters. It prefers tropical and warm temperate seas mainly at temperatures above 23°C. It gets its name from the smooth and silky texture of its skin. Its scientific name is Carcharhinus Falciformis. They are one of the larger sharks, typically around 8 feet long, though they can grow up to 11 feet. This species is long and slender, with slightly shorter dorsal fin and elongated pectoral fins. It belongs to order Carcharhiniformes, Family Carcharhinidae and Genus Carcharhinus. Silky Shark gives birth in summer from June through August. The litter size ranges from 6 to 14. This shark is a predator and feeds mainly on inshore and pelagic bony fishes, but also eats squid and pelagic crab. These sharks have also been known to feed on the bodies of dead whales. When viewed from the side, the head of Silky Shark comes to a sharp point. These sharks are commonly found throughout the Pacific, Atlantic, and Indian Oceans. They have an extremely strong sense of hearing which helps them in locating their prey. Female silky sharks have a gestation period of around one year and they give birth to 15 to 20 pups at once. This shark is brown-grey dorsally and white below. It has no special markings. The average life expectancy of the silky sharks is 22 years. These sharks have large, sharp cutting teeth and which are of a formidable size. Declan, Tobin. " 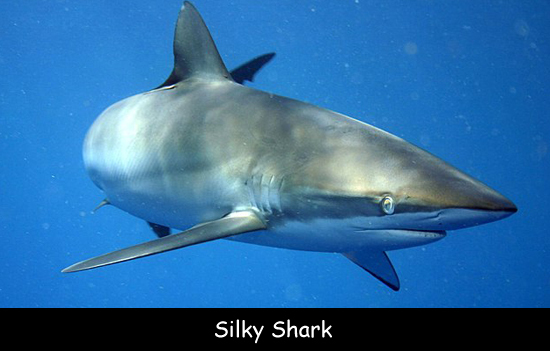 Silky Shark Facts for Kids ." Easy Science for Kids, Apr 2019. Web. 21 Apr 2019. < https://easyscienceforkids.com/silky-shark/ >.